Where can the Diploma in Professional Photography course take me? 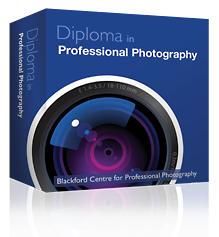 The Diploma in Photography will give you access to a sought after career. Qualified photographers take all kinds of professional photographs: weddings, family events, christenings, graduations, advertising and publicity, packaging, web pages, promotional material, portraits, business buildings, school photographs, conferences and fashion. You could also work as a freelance photo journalist. As a self-employed photographer you’ll earn good money and be able to work as and when you want. The Diploma in Photography will show you how to find clients, how to promote your portfolio and how to manage your photography business. A photography qualification gives the client confidence in you as a professional. Your creativity means you’ll be able to put into practise what may only be a hobby at the moment. You could sell your photographs from your website, giving you the opportunity to make even more money. A new idea that is currently popular is to employ a freelance qualified photographer for personal photo shoots. These are photographic records of personal events, such as a honeymoon, party or family event. There’s so much more to photography than just wedding shoots.